Howdy, folks! I’m shaking things up in today’s EDIT because I am in a color craze this week. There are just so many sassy pieces in vivid shades this season and just doing a couple of them per EDIT isn’t doing them justice. And let’s be honest, we could all use a little more color in our lives. Today is all. about. color. My favorites from this week’s EDIT are these hot espadrilles (under $100) and this adorable Thakoon Addition pink top + shorts combo, but I certainly wouldn’t turn down this bag if someone wanted to buy it for me… Which are your faves? Tibi launched an amazing sample sale yesterday with ready to wear and shoes at up to 70% off! This pretty blue coat and these zebra-printed pants are both in my cart. Also loving these ankle-strapped sandals. Click here to shop the sample sale now! As I mentioned last week, I’m really trying to slow my spending – I did after all just quit my job to work at home. Not very conducive to blowing my bank account! With that in mind, I still have so many functions coming up (now 9 weddings + their social events) that I need cute outfits for. I’ve been scouting the sale pages of Neiman Marcus and found some wear-now items deeply discounted. How perfect is this blue Halston Heritage dress for a spring wedding? Isn’t the bow detail adorable? Also loving this lime green frock and this pink & white number for a casual rehearsal dinner or engagement party. Last but not least, this Nanette Lepore skirt is the cutest spring print and color scheme. All things you can wear now and the rest of the summer! Have you entered the Kendra Scott LUXE giveaway yet? It may be the best giveaway yet, and you only have until Friday to enter! Don’t miss out. Click here for details and to enter the giveaway today. I want the shoes number 12…perfect for Spring and Summer..
Love all these colorful pieces, so fun! 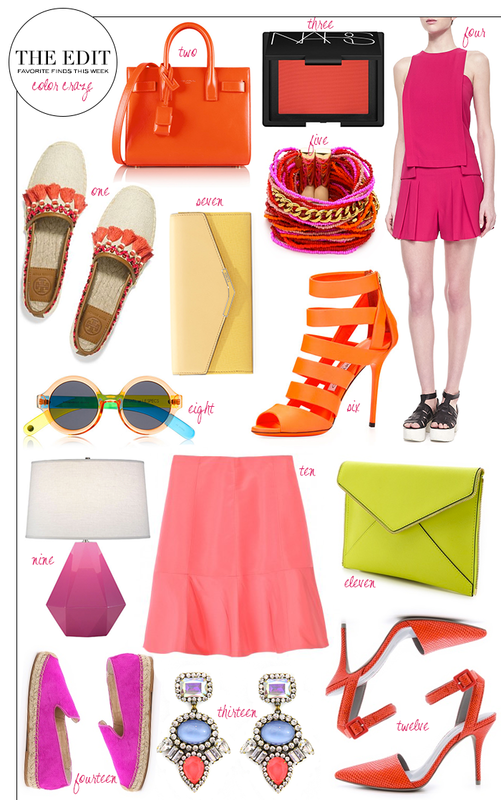 Such bright fun picks this weeks, obsessed with those orange Jimmy Choos! #5 and #8 need to get in my closet! I love those espadrilles, will definitely need a pair for my Spring wardrobe! Have you checked out the J.Crew striped ones – only $60! And congratulations on your new job situation, I absolutely adore working from home! I love so much on this! I think I need 1, 2, 5, 6, 8, 9, 11 and 13!!! I have loved those gem stone shaped lamps for years, so fun in that bright pink hue! Oh Tibi is one of my favorite designers, I will have go check out that sale! I’m loving all of the oranges and corals, especially that handbag!! Eeeeek I love these colors, so pretty! ooh…so refreshing and spriny! I love those fuchsia flats! Ahh I love all these bright colors! Those heels (#6) are the best! Love all the vibrant colors!! That Saint Laurent tote and Rebecca Minkoff clutch are calling my name! So chic! Ohh I love this! All of the espadrilles are my favorite! Love love love the pinks and oranges! I REALLY want that clutch! I’ve been dying for that Saint Laurent bag! And also crushing on the Loren Hope earrings! my friend just got those wangs and I want to steal them!!! Do I have to pick a favorite? These colors are awesome. Really love all the orange. I love it all! And I’m keeping my fingers crossed for the giveaway! 1, 5, 11, and 14 please!! Hi Merritt, Thanks for the tip on the Tibi sample sale. I’ve never purchased anything from this designer but see some pieces that are tempting (and final sale). Might you be able to share some insight as to how the sizes run? Many thanks! The dresses and tops tend to be smaller in the bust, so I’d go a size up if you’re worried. Pants and skirts fit true to size for me. Hope that helps! okay, these bright colors just got me REALLY excited for spring. too bad it is currently snowing in washington dc :( enjoy your warm weather. i will be rocking those bold hues once its a tad warmer here. Love all of these bright colors! That romper is too cute, and the bag is fabulous! These colors reminds me of a fiesta. Love the Jimmy Choo shoes and Saint Laurent bag. Dying over those TB pom pom shoes…loving everything in this round up! Love all the pops of color! Hello Spring! Obsessed with orange lately. In fact, it serves as the pop of color throughout the décor in our new house. Love it, and the zipper detail of the RM clutch. I don’t own a chartreuse colored bag YET so….